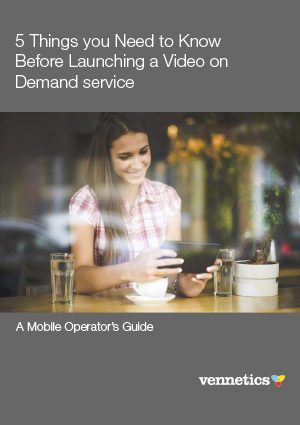 The purpose of this eBook is to provide you the reader with an overview of five key areas you will need to consider before launching a Video on Demand (VoD) service. At Vennetics (vennetics.com) we provide VoD based services to operators in Europe, Canada, USA and the Caribbean. It’s been our experience that the following five areas are key to informing decision makers as to the challenges and opportunities that a VoD service presents. Challenges such as meeting the evolving entertainment demands of your customers, while preserving the economics of your mobile network and at the same time creating a new opportunity for revenue growth.